Maximum Altitude – 4182 m/ 13800 ft.
10: 30 AM. - Report to base camp. 6:00 AM - All the team members need to wake up. 8:15 AM - Luggage deposit. 8:30 AM - Move from Kasol by taxi. It will take approximately an hour to reach the trek trail. The trekking will start from Kasol to Grahan village. First drive on road till the trail starts. The trail leading upto the village is frequently used by the locals and you might found villagers passing by. The trail leads through lush green dense forest, streams and waterfalls. The trail is easy at initial. Soon the gradient transforms into rocky and steep after crossing the Grahan Nallah. As we get closer to the Grahan Village the trail becomes pretty steep for a while and the village is visible. The campsite at Grahan is located near to the village and is surrounded by the Rhododendron trees. Grahan village is as ancient as hundreds of years. One can charm traditional houses beautiful evenings and take pics of the locals near the camp. The beauty at the camp becomes more comfortable and scenic as one gets acquainted, this camp is heaven for photographers, artists and nature lovers. Spend the night at serene campsite. Today we trek about 6 to 7 hours to Minh thach. The trail to Minh thach is usually used by the locals to take their livestock to higher pastures. The trail offers great range of flora and fauna birds, insects etc. As we go higher the trail becomes steeper and leads into the woods. On the way we stop at amazing lunch point in between the forest at Ratapani. The mesmerizing thick canopy can be witnessed while passing through the dense forest. The trail through the forest eventually opens up to a grassy patch of land. After that the forest will vanish slowly and open grounds and valleys are visible. One can admire the snow capped mountains and valley below. Before approaching to the camp we have to climb a steep section. The Minh thach is located on the hillock and is surrounded by the flat rocks. The sunset and sunrises at this camp offers great views. One can also cherish gazing stars and milky way at night. On this day make an early start to approach Nagaru. The trail today is comparatively steep than the previous route. It will take about 7 hrs. to reach Nagaru. The trail climbs through pastoral forests to snow covered meadows, which makes it little tricky. As you climb higher the air becomes thinner and you might face little altitude sickness such as headache, dizziness. These symtoms are normal reaction of the body. So take as much water and keep your hands, nose, eyes and ears open to acclimatize better. But in any odd situation, we provide all the facilities including the first aid kit, portal oxygen, oxymeter and pulsemeter. While getting closer to the camp chilling winds hits on your face, that realizes one of the altitude gained. The surroundings become more open and broad at these heights (12,500ft.). It is a coldest campsite of the whole trek because of the gusty winds. The temperature can go below zero at nights. Once you reach the campsite at Nagaru one would experience picturesque views of magnificent mountains across the Parvati Valley. Enjoy the sunset painting the sky with different colours and the night full of stars at this beautiful campsite. Again make an early start for a long trekking day. The trail comes with snow and steep tracks on most of the route till the pass and beyond. After climbing the Nagaru ridge, the trail is moderate. On the way there is a canteen near the lake where one can have maggi, tea, coffee etc. Climbing higher to the pass offers mind blowing views of the stunning meadows and towering peaks of Parvati valley. One should walk slow and steady while climbing upwards. Though walking on the snow is easier. As approaching to the top the gradient becomes steeper just few meters below the pass. That’s the only steep part needed to be crossed for the day. Reaching at the top of the pass gives a feeling of satisfaction by looking at the mighty Himalayan snow capped peaks green meadows and the trail below. One can spend some time at the Sar pass having his packed lunch and taking pics. After the pass there is a great slope ideal for sliding which takes one a kilometer far within minutes. Then continue trekking down on gentler slopes through rhododendron trees till the Bishkeri Thach. After a long tiring day the lush green meadows, wildflowers and variety of birds at Bishkeri can rejuvenate your body and mind with energy. We’ll camp for a night at this soothing site. The trail from Bishkeri to Barshaini is mixed with downhill to moderate. On this route one has to be careful walking each step on the slope. Again walking slow and steady will help one to approach the roadhead easily. We will climb down through dense forests of deodar oak and pine. Many little streams will pass by the trail. On the way beautiful meadows huge trees, piles of fallen and rotten logs will give a prehistoric feeling. Herds of wild cows, bulls and horses can be seen on lower pastures. One can taste lassi (Buttermilk) sold by the locals while climbing down. Couple of tea shops will pass by, where one can enjoy their preferred food. After hours of mesmerizing forest trek we reach at Pulga village. From there moderate walk to Tulga village. Then cross the Parvati river and climb for a while to reach Barshaini. From Barshaini we will take bus or taxi. Then we reach Manikaran in an hour. Manikaran is a most famous hot spring you can find in Kullu - Manali region. It is also one of the sacred place for Hindus and Sikhs. After Manikaran one can depart for their preferred destinations. After reading through the itineraries, we are sure you want to join the family of Himalayan destination by joining this trek. Good luck!!! 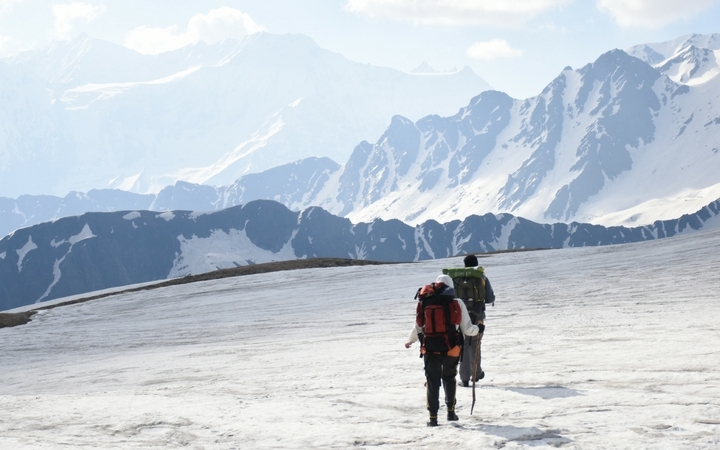 Sar pass is one of the most popular trails in Shivalik range. Sar, in local dialect, means a lake. Sar Pass is a moderately challenging trek in the Parvati Valley of Himachal Pradesh, situated at an altitude of 14000 ft, it can be considered as a great introduction to high altitude trekking. This trek is also very popular amongst Indian trekkers. Sar valley overlooks the beautiful Parvati valley abundant in natural treasure.